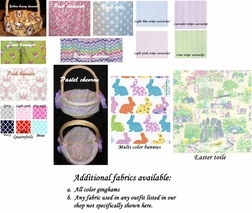 Our lovely basket covers, liners are perfect for Easter and are hand crafted upon your order and made of fabric of your choosing. 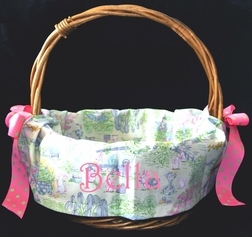 You also choose the coordinating ribbon to be used to tie the sides of the liner around the basket handles and the monogram font/color. 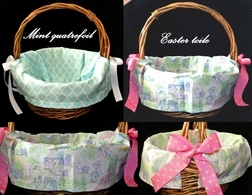 The liners are perfect for any room in your house, but are especially wonderful as an heirloom, keepsake Easter Basket liner. Regular: Fits baskets up to 12 inches in diameter. 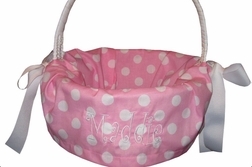 Large: Fits baskets up to 15 inches in diameter.